Facts & Info about the Statue of Liberty: She stands at the entrance of New York harbor . . . a 151-foot statue of a woman holding a book and a torch on-high. American name is the ‘Statue of Liberty’ and she adorns not only New York’s harbor, but also Swan Ally Island in the Seine River in Paris and also Paris' Luxembourg Gardens. Yes, there are three Lady Liberties! They are all symbols of friendship, freedom and peace between the US and France. Emma Lazarus poem "The New Colossus"
We [the US and France] have architect and sculptor Frederick Auguste Batholdi to thank for this beautiful lady in more ways then one. The original ‘life size’ cast of the Statue of Liberty stands amongst the beautiful flower gardens and fountains of Paris Luxembourg Gardens [which is home to the French Senate] in Paris. On her pedestal she’s approximately 15 feet high and absolutely ‘magnifique’ among the flowers and trees. This was architect/sculptor Batholdi’s miniature mold for the American Statue of Liberty. However, it’s creator Bartholdi was most upset that it did not face the New York location of the Statue of Liberty. But with persistence, as was his nature, Batholdi finally achieved getting the statue turned to face America at the time of the World's Fair in Paris in 1889. What does the tablet say on the statue of liberty, that the Swan Alley Statue of Liberty holds? It is inscribed with the dates IV Juillet 1776 et XIV Julliet 1789 [the dates of the US and French revolutions. Now then, there is America’s Statue of Liberty, on Liberty Island in New York Harbor, and the most majestic Lady Liberty [as she is affectionately called] of them all. She's over 151 feet tall [on her base she’s more than 305 feet tall] and she’s truly magnificent! The statue was a gift to America from the French in honor of the Centennial of American independence. It is one of the most universal symbols of political freedom and democracy. 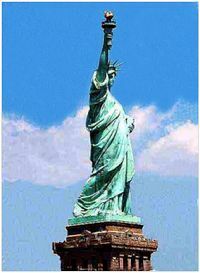 The statues title is ‘Liberty Enlightening the World’ [but it is known to Americans as ‘The Statue of Liberty’]. 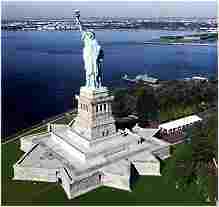 The Statue of Liberty annual budget amounted to $13,261,000 for fiscal 2004. Now that our memories are refreshed about the Statue of Liberty [and her sister statues], we can only hope that everyone, on both sides of the Atlantic, remembers what she stands for - Friendship, Freedom and Peace between our two countries, and symbols for the rest of the world! We've given each other these symbols for these specific reasons! We all need to regroup and rethink our thoughts and feelings [both countries' governments as well as their people] and put all ill will behind us! These symbols reflect their true intents. I think it’s absurd for our two countries to be at such odds, with such binding ties as the ‘Statue of Liberty’! Let's really celebrate our Independence days, and lay the bitterness to rest!